Parfaits are alwayssss delicious. Combining different flavors, and textures, they can please any palate. Jello is a fun ingredient, but often, vegetarians and vegans find it difficult to mimick the texture gelitan free. However, there is a secret ingredient for everything! I came up with this recipe for a healthy and refreshing dessert parfait. Finely chop fresh lychee if you would like to add it into the jello. You can use drained canned lychee too if you can’t find fresh ones. In a heavy-bottom pot, heat up juice until it starts to simmer. Then, add in the agar agar and sugar. Stir well and bring the mixture to a boil. Reduce the heat to a simmer while continuing to stir for 5-7 minutes or until both the agar agar and sugar have dissolved. Pour mixture into a shallow pan or thali. If you are adding fruit, pour half of it in the pan, then sprinkle in the chopped fruit, and pour the remaining mixture over it. Cover the pan and chill in the fridge for 2-4 hours or until it has set. First, scoop your watermelon, cover and set in fridge. 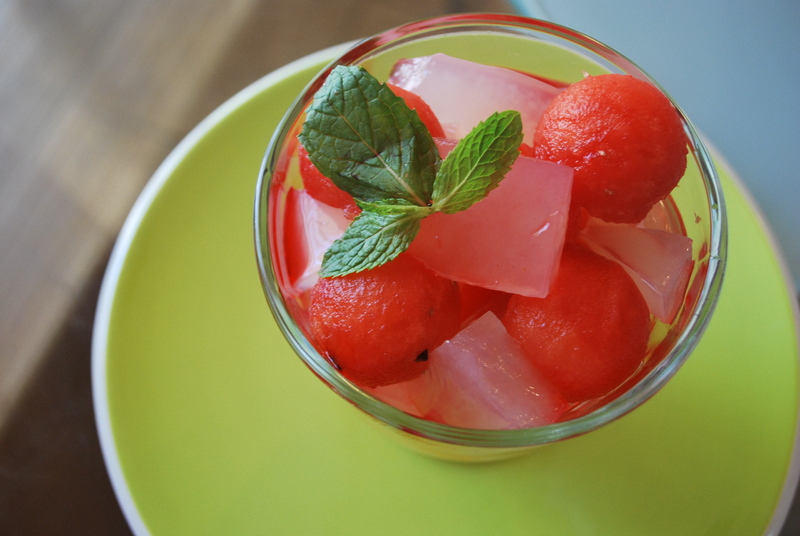 Arrange watermelon with Lychee jello pieces and mint leaves in a parfait glass. Drizzle rose syrup over the parfait and savor every bite.